Syros is another quite beautiful Cycladic island but decidedly different to both Mykonnos and Santorini in flavor.The port town is called Ermoupolis and it is larger, for one thing, more impressive and extremely elegant. All the streets are paved with white marble–the roads too. Structures along the streets front are painted in the softest pastel shades of peaches and cream. Our first stop was the large main square called Plateia Miaouli which as Lonely Planet puts it, is indeed “worthy of Athens”. An imposing Neo-Classical Town Hall sits in a square ringed with fashionable cafes and stores, all of which, unfortunately, were closed for the weekend. After we rested our feet for a while–for the gentle climb had taken its toll on mine– we continued wending our way up the hillside to arrive at the lovely Church of Saint Nicholas that dates from the 1840s. Since neither Llew nor I had visited any of the famous Greek Orthodox churches until this point in the trip, we resolved to enter the church and check it out. And how grateful we were that we did! In the church, a Christening service was in progress and the baby lay quietly in the arms of its parents with its god parents in tow. The church was ornate in the extreme with paintings coverings its wall, crystal chandeliers in bright colors pouring light upon the marble floors and the fragrance of incense filling every crevice. The ceremony, in Greek, of course, was lengthy and very ritualistic, involving a great deal of song and movement and offering us Greek theatrical pageantry for which we had not bargained. We enjoyed it enormously and having watched for almost an hour, decided to go outside again. Darkness had fallen over Syros and our attempt to find a suitable restaurant for dinner began. How lucky we felt to find a small eatery open that served us a fantastic Greek Salad and huge Meatballs in Lemon Sauce. This was truly the taste of the Mediterranean and we feasted heartily over a bottle of Mythos beer. Earlier in the evening, we had visited one of the many confectionery shops that line the water front and had picked up some of Syros’ famous treats–nougat and clove and orange flavored marzipan and some more sokolatina (chocolate mousse pastry). With these treats in our possession, we boarded the ferry Romilda at 9 pm for the long overnight sail to Santorini. It had been a terrific day–easily one of the best in our Greek Odyssey and one I know I will long remember. 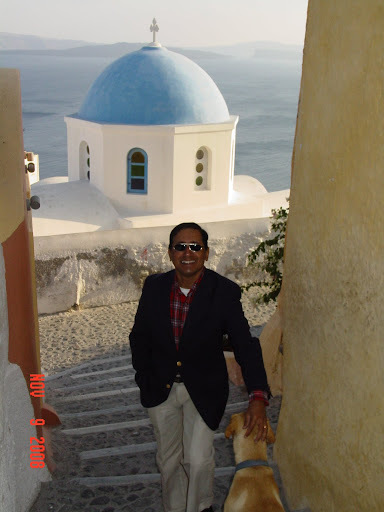 To follow us on our travels in Santorini, Please click on the link. 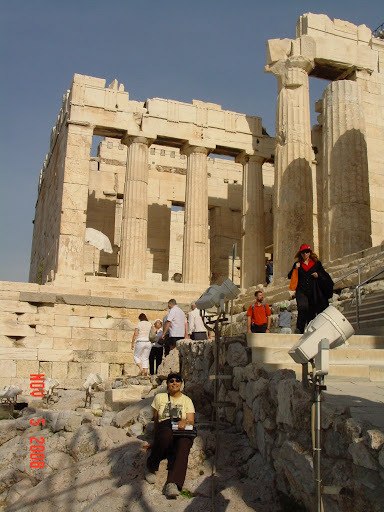 This entry was posted on April 12, 2006, in Bon Voyage!, Europe, Greece. 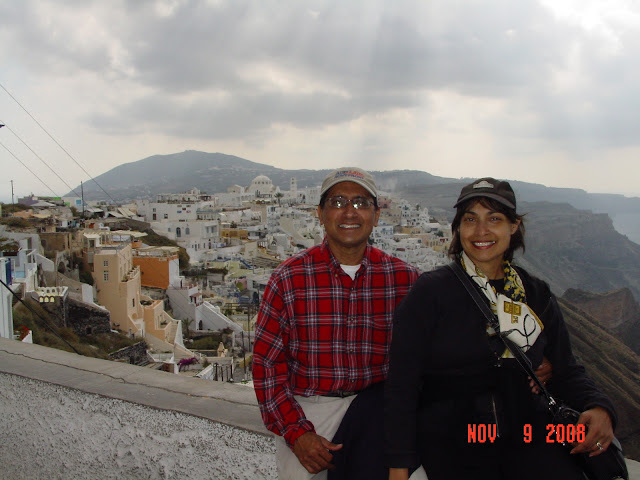 At Fira on the Island of Santorini with the volcanic slopes behind us. Santorini is reputed to be the most beautiful of the Greek Islands, so it is not surprising that almost all cruise ships plying the Mediterranean make a mandatory stop here. This has also bestowed a peculiarly snazzy aura to the island that belies the simplicity and authenticity of its native people. Of course, when spared the madding tourist crowd, the island offers pure delights of natural scenery and spectacular sunsets and it was in search of those that Llew and I included it in our itinerary. We had snatched a few zzzs on the Romilda as it made its way around the Cyclades by night stopping at Argos and Tinos and Ios and a number of smaller islands before depositing us before daylight at Athonios Port where Agapi, our landlady from Villa Agapi, awaited us with a placard proclaiming the name of her establishment. 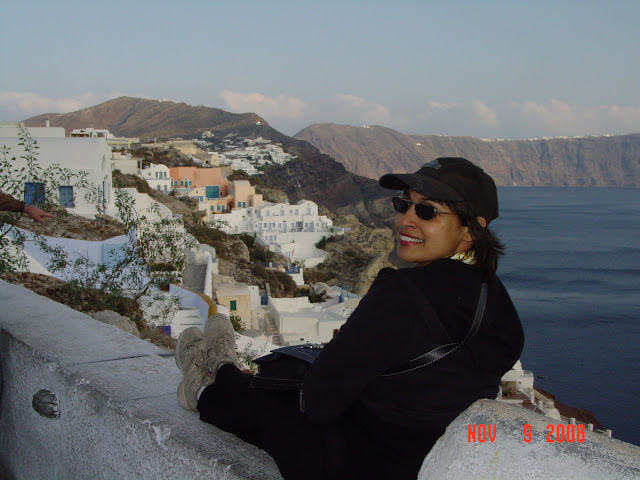 Despite the fact that dawn had not yet broken over the island, I could discern the steep rocky cliffs that loomed above us giving Santorini its distinctive profile. As we wound our way by car over the mountain roads with Agapi at the wheel, we took in the strangeness of these new environs–large expanses of virgin land lay waiting to be discovered. Frenetic construction activity all over the island proclaimed the new economic boom that has led to its recent prosperity. When we did arrive at the white and turquoise blue highlighted building that is Villa Agapi, we were enchanted by the kidney shaped pool and its matching blue and white striped deckchairs and umbrellas. 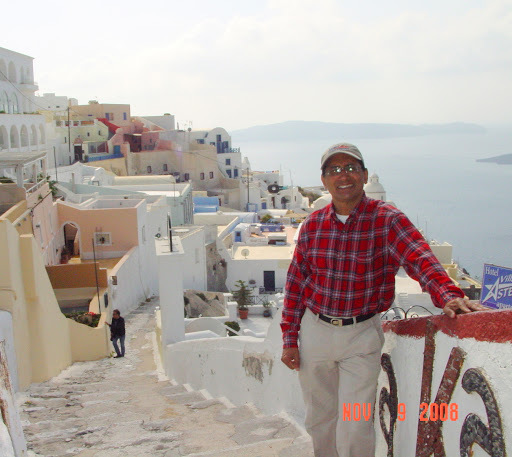 The repetitive colors of blue and white made me wonder if the Greeks pay tribute to their blue and white striped flag that is ubiquitous or whether these colors reflect the azure-blue Aegean waters and the white washed houses and churches that dominate its landscape. Half past six was no time to contemplate these possibilities and so we settled for a snooze in our lovely comfortable rooms whose balconies provided unbridled views of the sea. At 9 am, we made our way to the Reception area for a hearty Continental breakfast of toast and Lurpak butter (I have developed a huge liking for Lurpak) and strawberry jam, strong coffee and a chocolate marbled cake with orange juice. Well fortified against the rigors of the sightseeing that lay ahead, we took bus directions from Agapi to get to Fira, the nearest and largest town on the island. But despite waiting for a quarter of an hour, we were not rewarded with the sight of a bus and my weak feet prompted me to do something I haven’t done in years–stick out my thumb and hitch a ride. How delighted we were when a car stopped within a few minutes and a lovely young lady named Angela, en route to her job as a salesgirl in an expensive jewelry store, told us to hop in. Angela also proved to be a worthy tour guide and, at her suggestion, we began our exploration of the town at the pale peach and blue Dominican Monastery perched at the very top end of the town. This extremely evocative space presented to us the uniqueness of Byzantine Church design–a central dome covered with mosaics or paintings and one or a pair of steeples that flank it. The atmosphere in these environs was quaint and spoke of ancient worlds and it was quite enchanting to explore these quarters. What I found most interesting about Santorini and what makes it different from Mykonnos was the streets–while those in Mykonnos are composed of large flag stones cemented together with white mortar, the ones in Santorini feature tiny black volcanic cobbles held together by cement paste. The effect is very pretty indeed and since the entire town is covered with this flooring, it brings a kind of uniformity to the space. Fira’s town center is composed basically of three main streets that sit in tiers, one on top of the other, on the volcanic mountainsides. These mountains rise tall along the water’s edge, the result of volcanic activity, centuries ago, that have left huge craters on the island’s surface and have created hot springs on the neighboring isles that lie just across the port. We passed by a number of shops and cafes, bars and tavernas–some sold high-end merchandise such as crystal by Baccarat and Lalique and gold jewelry. Clearly targeted at the cruise crowd, these stores were so different from the little souvenir stalls that exuded local color. Following signs that led towards the cable car, we ran into Angela again at her store. It was she who pointed out the mule paths to us–the one that allows visitors to climb the mountainside on the backs of these sturdy animals if they prefer not to take the cable car, the island’s newest nod to technology. This vantage point offered stunning vistas as far as the eye could see and we posed for many pictures before we decided to explore the smaller shops. Along the coastal path were a variety of restaurants such as Franco’s of Fira which offer startling views and must be hugely popular in the summer. Most of them were closed for the season but we had no regrets at all as we enjoying wandering through the narrow streets without having to elbow our way through frenzied tourist hordes. At the southern tip of the town, we arrived at the pure white Byzantine Cathedral, unfortunately closed, but, nevertheless, creating a distinctive addition to the landscape with its dome and tiered walls. It was then time to go out in search of lunch and having read up a lot on the native ingredients of Santorini, we decided to find a place that would serve us the local delicacies. These include the “waterless” tomatoes, a variety that is never watered but receives its water only from the precipitation in the atmosphere. There are also fava beans that are made into a mash and served with red onions. Saganaki is a cheese that is batter clad and deep fried in the style of Italian mozarella sticks. 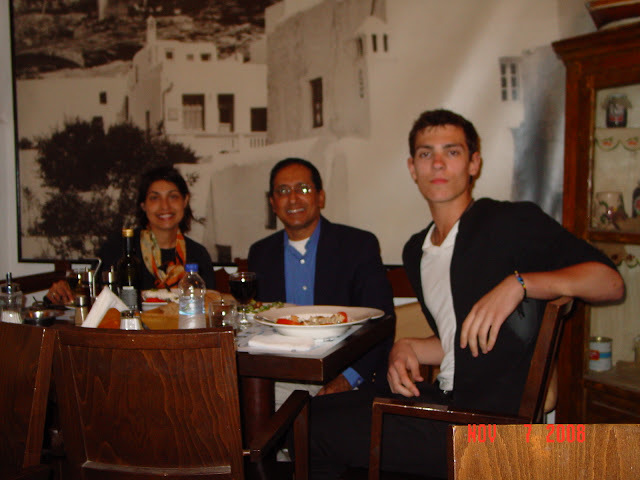 Fortunately, a restaurant called Ceasar’s that served both Italian and typical Greek food was open and we seated ourselves at a table and ordered the traditional Greek medzes platter–an idea that allows for casual ‘grazing’ and a taste of several preparations at the same time. So we were thrilled when we were presented a variety of nibbles–those famous tomatoes, the fava bean mash, tzakiki (cucumber-yoghurt dip flavored with garlic), taramasalata (fish roe dip–far more yummy than it sounds! ), olives, feta cheese, aubergine mash, cucumbers and capers, served with lovely toasted garlic bread. We also asked for the Saganaki cheese and enjoyed the whole thing with the local Greek beer called Mythos which was extremely refreshing when served cold. Everywhere we went we loved the food. Not for nothing does the Mediterranean Diet have such a fine international reputation. We found ourselves eating healthy and very reasonably priced meals and resolved to include some aspects of this cuisine into our daily eating habits. Replete with our lunch, we were able to go out in search of the local bus station to take a ride to Ia, the village that sits perched high up on the volcanic cliffs and promises some of the most stunning sunsets in the Cyclades. Several other tourists had the same idea and we were soon off on a ride that offered turquoise views of the Aegean at every turn–literally–for the bus snaked around the mountain roads, twisting and turning precariously as it confronted hairpin bends. Soon, we were at Ia, walking along its charming cobbled streets and passing by its houses and shops, most slumbering softly in the bright sunshine as it was siesta-time! Few signs of life presented themselves to us and but for the innumerable stray cats and dogs that populate every one of the Greek islands, there was no life in sight. We did, however, run into two middle-aged American women from Birmingham, Alabama, who expressed the opinion that were most unhappy with America’s new President Elect and told us that they were en route to “Is-tin-bul”. We also met another American couple from Louisiana, on their honeymoon in Greece, who unable to find a ferry to Crete which they intended to explore, were stranded on Santorini for a week–well, I can think of worse places to spend a honeymoon! They were relentless explorers and the lady complained to me of aching calves from all the walking they had done in the past few days. I told her to make sure she supports her arches with really good walking shoes! Ia is not much different from Fira. The structures hug the sides of the cliff and seem to hang precariously over the steep precipice at every curve. However, they have charming and very unique architectural details that give the Grecian islands their own ambience. A vast number of churches are sprinkled over the cliffs, their domes painted in vivid turquoise. Gates and doorways are painted in bold primary colors while the walls of these structures are washed in pale ice-cream shades of pink and peach. Most houses are arched and there is rarely a straight line on a structure. This gives the entire town the sense of flowing along the mountains on tiered waves. Onward we pressed towards the northern-most tip of the island in the hope of finding the spot from which the grand sunsets are spied. When we did get there, we found it to be a castle-like stone structure mounted on the promontory for the particular pleasure of watching the sun sink over the Aegean horizon. A few of the tourists who had boarded our bus had beaten us to it and they were taking pictures against every angle and curve of the island. Llew and I settled down to watch the drama of the scenery spread out before us–the glimmering sea beneath us, the unique island landscape of Greece around us–and discovered that on the opposite side of Ia, the colors are different–or are completely absent. Indeed, the other side of Ia is a plain dazzling white, created by painting sides, domes and walls of structures in a uniform white. But this is far from bland–in fact, it is startling because when streaks of color do occasionally appear–in the base of windmills, for instance, or against the dome of a church–it is so enlivening and so charming. Darkness comes early to Greece in the autumn and we expected the sun to set at about 5. 30 pm. However, the last bus returning to Fira was scheduled to leave at 5 pm. Deciding that it was not worth missing the bus, since low monsoon clouds had amassed themselves at the horizon and would have obscured our views of the sinking sun, we decided to get a move on and walk towards the bus stop. As the bus wound its way downhill, we could see the golden lining on the grey clouds at the horizon and felt comforted for we had not made an unwise decision to leave. Back in Fira, we found a souvlaki stall and decided to buy ourselves take-out kebas. We had missed the last bus to Karterados where our Villa Agapi was located, so took a cab for five euros to our doorstep. We ate our takeaway dinner in our hotel after which Llew watched Greek TV to obtain some snatches of Obama’s victory while I spent time reading up on Greece’s history. Santorini was indeed sensational and undoubtedly deserves its reputation. We were glad that we would have the next morning to continue to enjoy this corner of the earth that seemed somehow so far removed from Time. 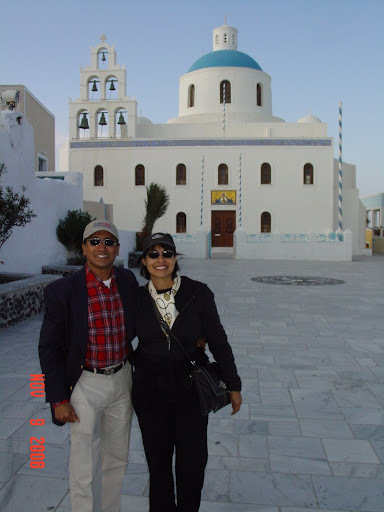 We had almost a half day to explore Santorini on our own before we boarded our ferry back to Pireaus Port. I would have loved to have visited “Ancient Thira” (as Santorini was once known), but the archeological site had closed for the season. I had no regrets, however, as we had already examined the lovely frescoes from Akroteri, the site that dates from 3,000 BC and has preserved wonderful Cretan frescoes on its walls. These have been excavated and are now preserved in the National Archaeological Museum in Athens where we had seen them. Instead, we decided to take a bus to Kamari Beach and enjoy a quiet, uneventful day on the sands. Or so we wished! As it turned out, we had a nice little adventure en route. In attempting to hop into a bus, we had spent more than a half hour waiting and finally opted to hitchhike again. Only no one seemed to be going in the direction of Kamari. In frustration, we stood on the opposite side of the road intending to hitchhike back to Fira. We were luckier this time round, for a nice man stopped and took us in and just a few meters on the road to Fira, we saw the Fira-Kamari bus go sailing by. The driver was so amused, he laughed heartily at our dismay. Then, suddenly hit by a brainwave, he asked us if we still wanted to get to Kamari. If we can, we said. Well, let’s try to follow that bus, he said, and catch up with it at a town ahead. So, before we could say “Aristotle Onassis”, he U-turned his car around and began following the public bus! As expected, the bus soon arrived at the little town of Messaria, where a number of passengers waited in a queue to board it. This gave us a few seconds to thank him profusely, dash out of his car and hop into the bus. We laughed at our little adventure and settled down into our seats to arrive at Kamari Beach about ten minutes later. Kamari Village seemed abandoned of all humanity when we arrived there. Not a human being was in sight though the local ‘supermarket’ was open. Equipping ourselves with freshly-baked spanakopita and chocolate croissants and chestnut yogurt, we walked along the silent streets towards the beach that beckoned insistently at the end of the road. “Let’s sit somewhere in the sun”, Llew said, “and enjoy our meal”. “I’m heading towards the sun”, I responded. “Let’s eat our breakfast on the beach”. And that indeed was exactly what we did. Llew was stunned by his first sight of Kamari Beach which lay devoid of any human traffic. The sand was black—one of the famous volcanic black sand beaces of Greece similar to the one we had seen on Hawaii’s Big Island. I spied a small deserted boat on the water’s edge and suggested to Llew that we should climb into it and enjoy our breakfast right in there, while gazing over the ocean. And that was exactly what we did! On our right, the volcanic cliffs loomed forbiddingly, their folds like giant elephant’s legs. On our right, the land curved around charmingly and behind us lay the promenade with its low buildings. The color of the waters of the Aegean seemed particularly striking that morning as the sun gleamed upon its crystal-clear surface and gilded the waves. We stuck our fingers into the waves to test the temperature and found it to be deceptively welcoming. Truly, we could have stayed there all day, but after a couple of hours, when Llew had been a beach comber, literally combing the beach of its assorted litter and bagging it for the garbage bins, we decided to go and explore the village. There were still few signs of life. Some fancy boutiques were open but nothing enticed us. We sat for a long while awaiting the arrival of the bus that eventually took us back to our villa at Karterados where we napped for a couple of hours, in keeping with the Mediterranean custom of taking leisurely siestas. Then, it was time for us to board our ferry, The Blue Star Itaki and cruise on the ink-dark Aegean for the last time. At promptly 3. 30 pm, our ferry left Santorini offering us our last glimpses of its salmon-pink houses perched on charcoal-dark cliffs. Out on the deck, we took pictures of the swiftly slipping sights, then settled down inside to enjoy the long sail to Pireaus Port in Athens, where we arrived close to midnight. Without any further delay, we boarded the last metro for the night that took us to Monastiraki, where we walked, with newly-gained assurance, to the souvlaki place called Thannasis, then carried our dinner back to Acropolis House which seemed like an old friend and made us feel as if we had arrived home. To read about our last day in Greece, please click on the link to Athens. 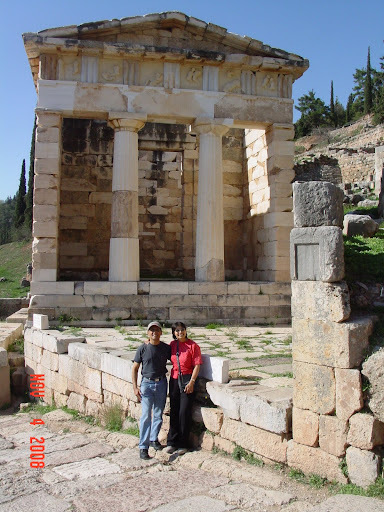 Annalisa Oboe, my Italian professor friend told me that while there wasn’t need to spend too much time in Athens, “Delphi was amazing”. So we asked for a wake up call at the crack of dawn (6.00 am to be exact) and got into our cab at 6.30 am to drive to Athens’ central bus station from where we were told to take a bus to Delphi. Our bus left promptly at 7. 30 am (12. 50 euros for the one way trip) and within an hour, Llew and I were dozing off as the Peloponese swept by outside our window. We passed by towns with historic names–Thebes and Arahova–quiet, practically deserted. 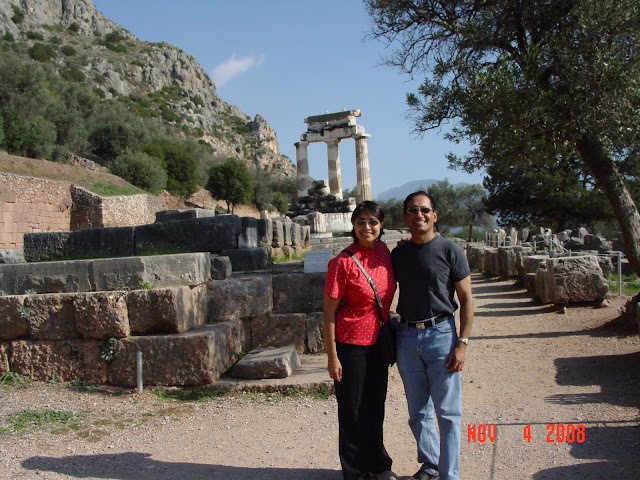 At exactly 10.30 am, we arrived at Delphi, a town whose location is so unique–it is actually perched on a mountain ridge that overlooks the Biblical Gulf of Corinth which lay asleep in the autumn sunshine, the village of Kira spread eagled on its shores. We purchased return tickets on the 4 pm. bus to Athens and without wasting any further time, decided to climb up the hill towards the Archeological site. Because my feet were not performing at their best, I had to take the climb very slowly, stopping for frequent breaks as we made our way along the Sacred Road towards the Temple of Apollo. The weather could not have been nicer–gorgeous blue skies draped the green hillside and as we gazed upon Mount Parnassos right opposite, we felt as if we were at the mythical Mount Olympus with the Gods themselves! We had the site almost entirely to ourselves. Occasionally, a group passed us by–serious travelers all, not casual tourists. Equipped with guide books and cameras, they studied each ruined remain, carefully, lovingly, awash in the colorful history of what was once a thriving city. 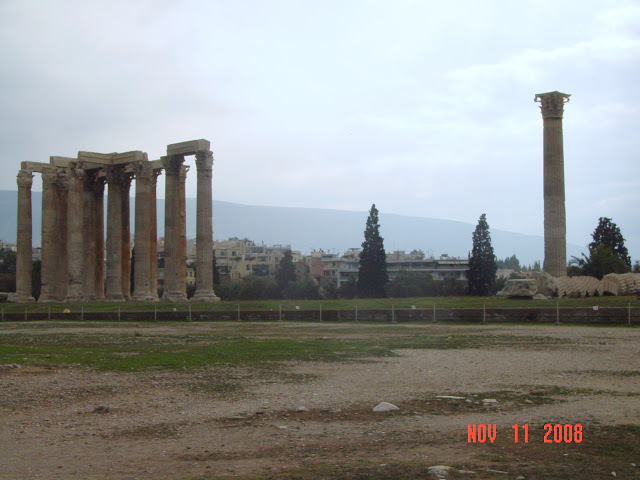 Along the Sacred Way, the Temple of Apollo (left) is intact, small but containing great “spirit of place”. All around stony mountains towered above us, their sides seemingly hacked out to make the stone blocks that fashioned the temples, the streets, the houses. Everything is “in situ”, just as it was centuries ago and I was repeatedly reminded of the glory of Pompeii, except that instead of reading inscriptions in Latin, I was reading them in Greek here. As we climbed the mountain, ever higher, the ruins gained perspective until we finally reached the amazing Amphitheater where plays by the great Greek tragediens, Eschyles, Sophocles and Euripedes were performed together with the comedic work of Aristophanes. I had to pinch myself because I could not believe that I was right there–in the exact venue where these greatest of dramatic works first made their presence known to the world. In a superb state of preservation, this amphitheater (left) gave us such a vivid sense of what it must have been like to watch dramatic works while overlooking the majesty of a mountain range.Then, we arrived at the Stadium, also in a fine state of preservation. Though we weren’t allowed to walk upon the field, we did see the starting blocks inscribed with the initials of the athletes who used them. My feet carried me up courageously to this point and I felt almost as stoic as those Greek gods as I dealt with the challenging terrain in my effort to see it all. Getting down the mountain was less strenuous, of course, but no less demanding on the tendons of my feet still recovering from recent inflammation. Still, I soldiered on, until we were back on the main road again, heading towards the ancient Castillian Springs whose cool water still flows out of the mouth of a stone lion. Llew bent down to fill our water bottle only to be confronted by a Greek man who took a look at his cap that said “Americares” and pronounced, “Obama, Obama”. Llew gazed at him bewildered, expecting him to be speaking Greek and not making the connection between the American elections that were only a day away. At this point, I turned to the man and said, “Yes, yes, we too would like to see Obama win”. Only then did it dawn upon Llew that he wasn’t speaking Greek at all! When we had refreshed ourselves at these ancient waters, we headed towards the Gymnasium where a large basin dominated the scene. This was used as a cooling pool by wrestlers who practiced their feats of strength and endurance in the open mountain air. Just ahead a path led to Delphi’s most significant monument–the Tholos or Rotunda, where the famous Oracle made her ominous predictions at the Sanctuary of Athena. As we gazed upon the marble columns of the monument (left), now almost entirely in ruin, so many scenes from history and literature passed through my mind. I thought of Socrates who was told by the Delphic Oracle, “Philosopher, Know Thyself”. Upon that one pronouncement is based the entire philosophy of the Socratic Method. Then, there was poor ill-fated Oedipus who was told by the Delphic Oracle that he would kill his father and marry his mother and oh my god, how awful that the prediction came to pass and led to the gouging out of his eyes! And then there was Alexander the Great who sought out the Oracle with the hope of being informed that he would conquer the world–only to receive vague infuriating answers that caused him to drag the Oracle by her hair until she cried, “Stop! You are the most invincible man in the world”. And with that, he let her go, stating “I have just received my answer”. Whew! Talk about egomaniacs! So Llew and I posed for pictures around the Tholos, still incredulous at the thought that we were in the presence of the ancient world’s most sacred sites, the Sanctuary of Athena, where prophecies were made and brought to pass. When we had our fill of the classical fervor of the site, we set out in search of lunch for my feet were almost killing me by this point. They led me to do something I haven’t done in a long time–hitchhike with Llew remaining out of sight until a kindly motorist stopped to give us a ride back to the village. There, we gratefully sank down into the bent chairs at Taverna Gargadouas where we ordered a Greek Salad and the house specialty, Provotina–Grilled Lamb. 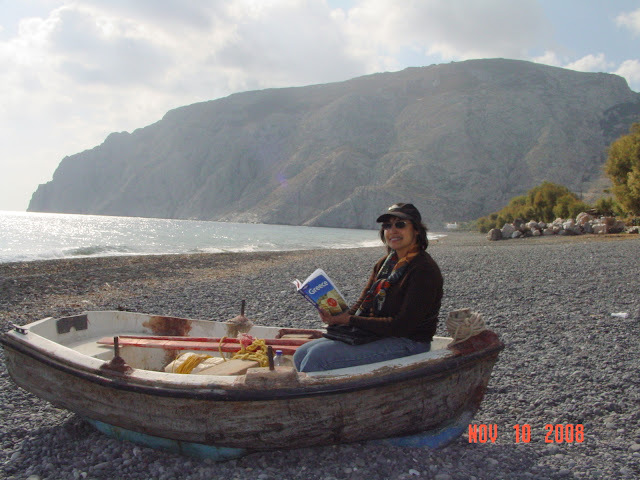 Over red wine (a huge glass for fifty cents made no sense at all), we relaxed completely and feasted our eyes upon the scene that lay ahead–Mount Parnassos and the Gulf of Corinth. Llew left me on a wayside wall to rest my feet while he wandered around the village. A few souvenir stores were still open but the lack of activity clearly proclaimed the fact that the tourist season had passed for the year. Back on the bus at 4 pm, we slept soundly for the most part. We had by then made friends with Anya Brug, an art historian from Germany and her boyfriend Andrea, an art historian from Italy, who suggested that we get off at Thissou to catch our first glimpse of the Parthenon illuminated at night. It was a very sensible suggestion indeed. A few minutes later, we were on the Metro (the underground railway network) that took us to the very foot of the Acropolis and allowed us to feast our eyes upon a truly breathtaking sight. We did not linger long, though, much as we wanted to, as I simply did not have the foot stamina to do any more walking. Instead, we hopped on to the metro again, got off at Monastiraki to enter the old crowded quarter of Plaka that is chock full of souvenir shops, bars, cafes and restaurants. It was at one of these that we enjoyed one of our most memorable meals–medzes (mixed appetizers) at Cafe Konstantin, where we tasted the most delectable preparations–some natural, others cooked only slightly. We savored the most succulent tomatoes and cucumbers, grilled zucchini and green peppers, tzakiki and spanakopita, fresh feta cheese and dolmades (rice stuffed vine leaves), broad beans in a spicy tomato sauce, olives and cheese pie. With a glass of red wine and the simplest of desserts–just Greek yoghurt bathed in thyme honey–we had ourselves a memorable meal. 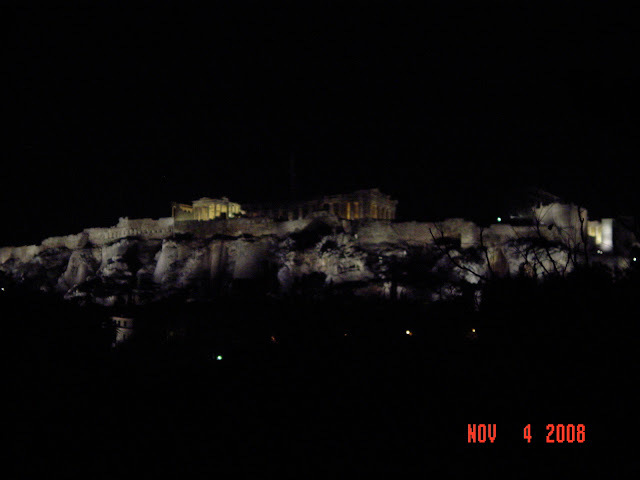 At the end of the evening, with the lights of the Acropolis following us almost back to our doorstep, we entered our hotel past midnight and slept the sleep of the dead, though Llew woke up in the middle of the night to discover that Obama had just taken Pennsylvania. With the near certainty that we’d have a historic Black President in the White House, he turned over and went soundly back to sleep. To follow us on our travels in Greece, please click on the link for Mykonnos. 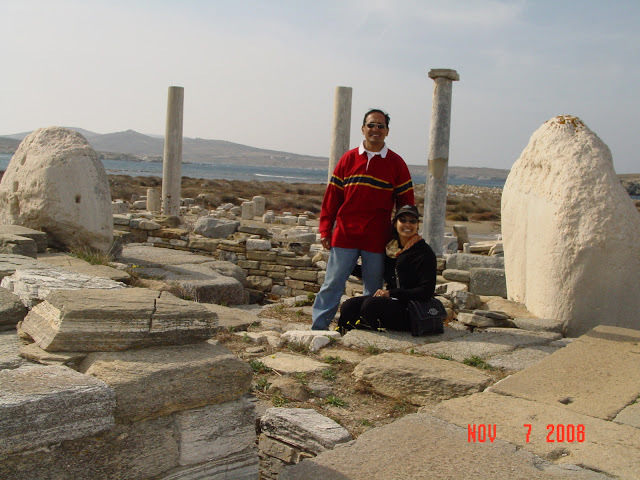 The day we spent on Delos was easily for me one of the highlights of our trip to Greece. In the morning, we ran into my student Vince Libasci again–a feat not improbable considering how few tourists were on the island. We had invited Vince to join us on the day trip to Delos and to share our breakfast–a rather good one based on delicious packaged chocolate croissants from the local ‘supermarket’, really not much more than a corner shop. To our great good fortune, the local boat had decided to ply that day, but only at 11 am. 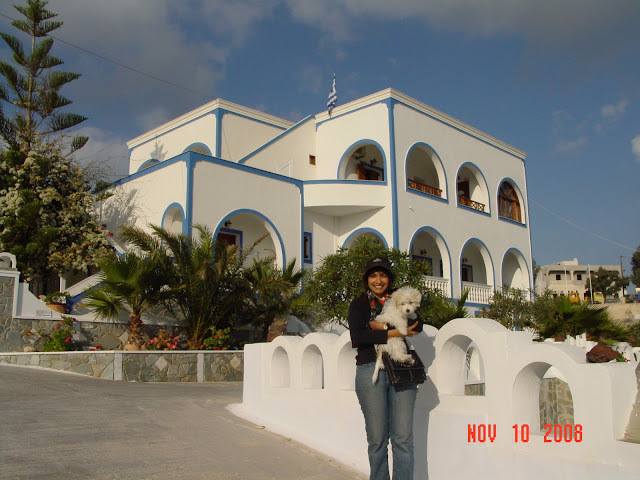 This left us a good hour to explore Mykonnos some more–an island whose magic spell quite enchanted me. Llew, Vince and I rambled in the Chora (pronounced ‘hora’), the main village with its maze of narrow streets and vividly painted balconies–red, blue, green–that were filled with late season geraniums and giant cactii in pots. Bougainvillea climbed walls in lush profusion and the entire effect was just lovely. It was hard to stop taking pictures as I wanted to capture it all on celluloid. At 11 am, we were back on the jetty looking for the “Delos Express”, a boat with a rather grandiose name, which we boarded with a handful of other visitors. The sea rocked somewhat disturbingly for me, but I closed my eyes and was grateful for the fact that Delos was only a half hour away. Soon, we were rounding its contours and taking in the stones and columns that were strewn all over its shores. 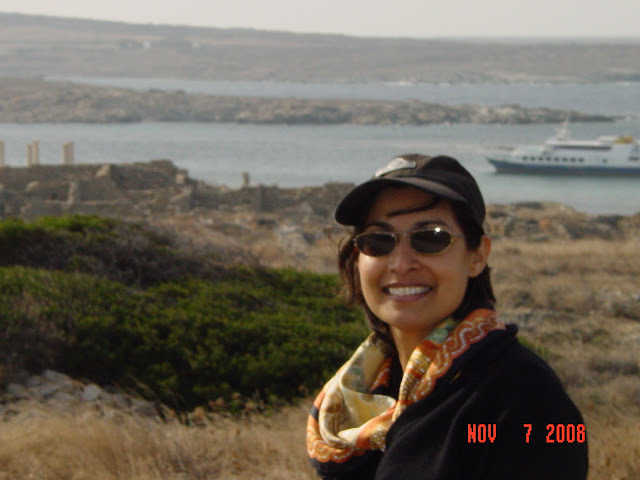 It is entirely thanks to my Oxford classmate and close friend Dr. Firdaus Gandavia, that we landed on Delos. When he had visited me in London from Bombay, about a month ago, he had recommended a trip to Delos which, he told me, “is archaeologically deeply significant”. And now I cannot thank him enough for making me aware of this island’s magic. 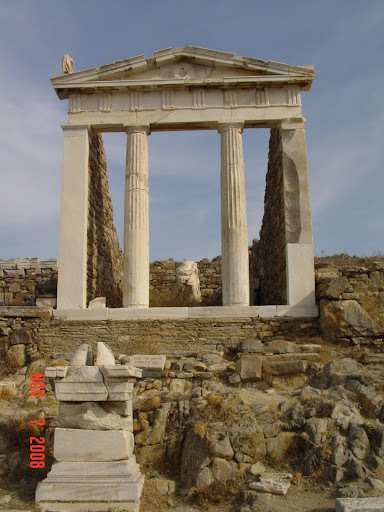 Delos is the most sacred of the islands in the Cyclades and is surrounded by the other larger islands–Mykonnos, Tinos, Argos, Syros, Naxos, Paros. It is believed to be the birthplace of the Gods Apollo and Artemis and every attempt was made to preserve this island as a tribute to their powers. Hence, by decree, no one was allowed to be born or to die on Delos. The bones of those once buried on the island were dug up and transported to another site and from then on, no one was ever allowed to spend a night on the island. To date, the Greek government honors the ancient conventions and the island remains uninhabited. Every single passenger that disembarks from the ferry boats are carefully counted and the exact same number is returned at night fall to Mykonnos. It is somewhat eerie to imagine what the island of Delos must be like at night–what ghosts walk around its ruined homes and fallen columns, I wondered? Once ashore, we purchased tickets (five euros each) to take a self-guided archeological tour of the island. By following the clearly-marked arrows, one could see the most important monuments–a perfectly semi-circular seat here, Naxian marble columns there. 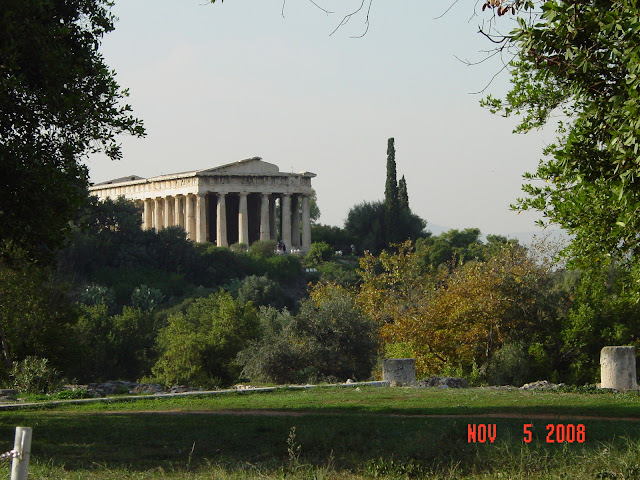 A Temple to Apollo, another to Dionysus. All signs were in Greek and, for some inexplicable reason, in French. It was only later in the museum that I discovered that the excavations on Delos, at the turn of the 20th century (1904-1911 to be exact), were led by a French archaeologist belonging to the University of Athens. His findings led to the unearthing of an entire city that, like Pompeii, lay buried beneath the rubble. Hence, what the visitor really does on Delos, is walk in a former settlement that thrived and was once the most important port in Greece. In fact, it was only more recently that Pireaus in Athens upstaged Delos’ importance. Bankers, seamen, financiers, made their homes on one side of Delos and their ruined mansions can still be visited, complete with their mosaic flooring and frescoed walls. Many of the treasures found in these homes have been moved to the National Archeological Museum in Athens, but a small museum can be visited on Delos itself. In it, one can see a vast number of archeological artifacts such as jewelry, statues, tables, urns, etc. It is a mind-blowing experience, especially since I had visited Pompeii only in March and been completely fascinated by this buried city that dates from 69 BC. Well, here I was on Delos, walking on the remains of a history that dates back over the last 3,000 years! 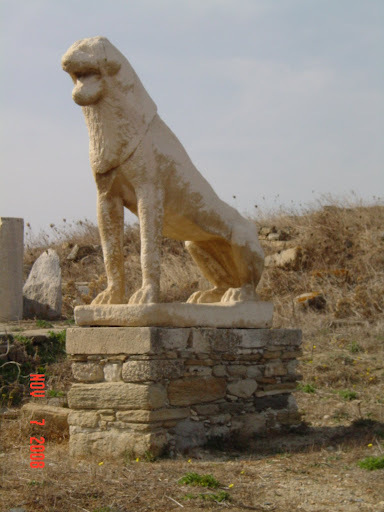 This is clearly evident at the Terrace of the Lions (left) where about six life sized lions made of Naxian marble and presented to Delos by the islanders of Naxos give the area its name. These are large, fierce, commanding, their presence giving the island its own peculiar character. These lions were placed outside for a century after being excavated and the elements took their toll on their features so that their faces and manes are stripped of all detail. Today, they are placed inside the museum with plaster replicas adorning the terrace. I was so stunned by all these sights that I was often speechless, unable quite fully to take in the mysteries of the classical world that were being revealed to us as I trod those ruined pathways. Further down the hill, the Amphitheater was in rather bad shape and will require a lot of reconstruction before it is restored to its former glory…but we were impressed by the underground Cistern that ran below the amphitheater and supplied the island with water. Even as I tried to take it all in, I watched as workers strove to put together, stone upon stone, those crumbled walls. It was especially wonderful for me to be able to see the connection between Delos and Pompeii. There were so many similarities between Roman and Greek lifestyle and culture in the classical past and this was reflected fully in their architectural remains. 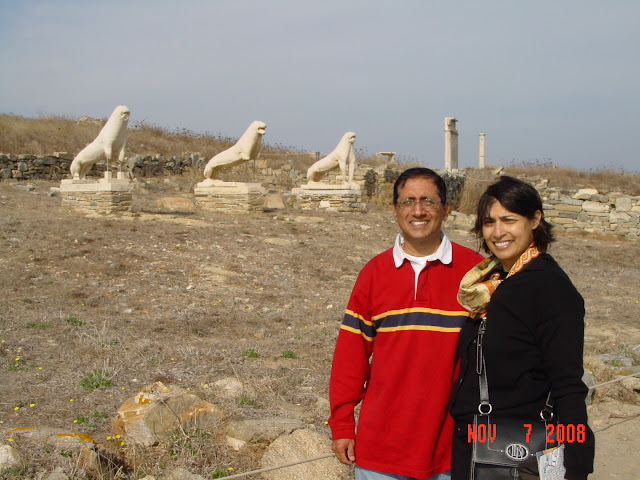 In like manner, it was especially moving for Llew to make the connection between Delos and Mohenjo-Daro and Harrappa in modern-day Pakistan, remnants of the cities of the Indus Valley Civilization that he had the good fortune of visiting many years ago. At 2 pm, when I was quite tired from all our exploration and seeing our boat puff quietly in the port, I was reminded of Tennyson’s poem “Ulysses” in which the restless hero of the Odyssey decides to set sail once again after a short visit to his wife and son Telemachus, as he “cannot rest from travel” and must “drink life to the lees”. This has always been one of my favorite of poems from English Literature and to see the boat lying in the harbor against the background of the bright blue Aegean Sea was deeply evocative for me. Llew had resolved that we should return to the British Museum to see the Parthenon Marbles, having visited the monument while in Athens. I decided to review the poem once again having spent so much time on the inky waters of the Aegean. By 3 pm, we were back in our hotel room for a long siesta. I spent time reading while Llew snoozed. At 7 pm, we stirred having made plans to join Vince for dinner. We chose a wayside restaurant called Madoupas on the waterfront which was filled with locals–always a good sign when one is traveling. In this place, we ate one of the most memorable of our Greek meals–The Mykonnian Salad was huge and consisted of rocket (mesclun greens), red louza sausage that is a specialty of Mykonnos, black eyed beans, tomatoes, olives and a Mykonnian cheese that was far more flavorful than feta. The light dressing of olive oil and vinegar made for a totally filling meal with the Greek bread served alongside and it was with difficulty that Llew and I shared our second course–Mykonnian Sausage with Fries. The sausage was spicy and went well with the blandness of the fries. Portions were enormous and we had enough for our next day’s meal in the doggy bag we carried back with us. By the time we returned to the beach, the few folk in the town had disappeared altogether and a ghostliness descended upon the island. We wondered why the shops closed down, only to discover that Friday evenings are when business comes to a standstill for the weekend. Since the thick of the tourist season was over, Mykonnos was in farewell mode and the stores and hotels were preparing themselves for the long and quiet winter months ahead when no cruise loads of tourists would hurry along its shores. 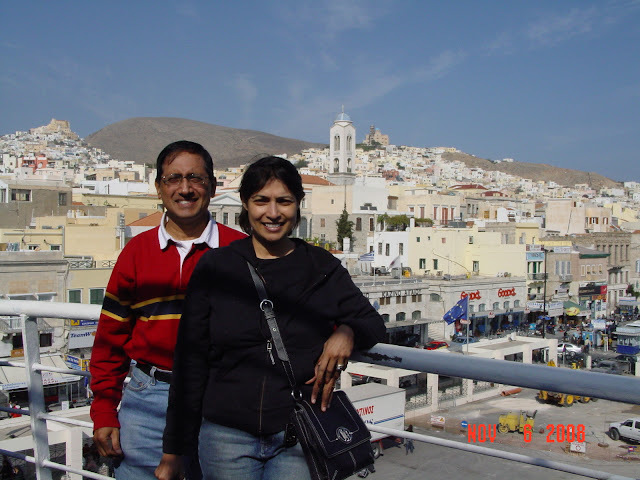 The next day, we left for Santorini, but had a five hour layover on the elegant island of Syros. To follow us on our travels in Syros, please click on the link. 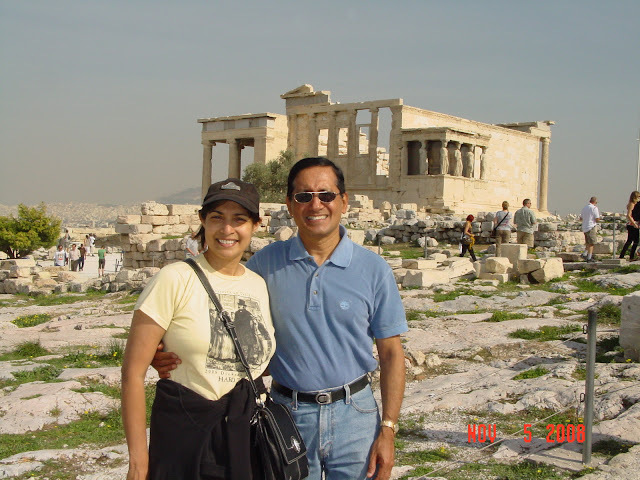 At the Erechtheion, part of the Acropolis Complex. We touched down in Athens rather refreshed from the snoozes we’d managed on our Easyjet flight from London’s Gatwiock airport. An hour long bus ride took us from the airport to Syntagma Square in the heart of Athens which was only a short stroll away to the Acropolis House Hotel where I had made accommodation arrangements. The place is old-fashioned and suitably gracious and we had excellent service from the personnel–Jasmine and Andreas–who went out of their way to be kind and helpful and informative. After a short nap, we set out to see the Highlights of the National Archaeological Museum. 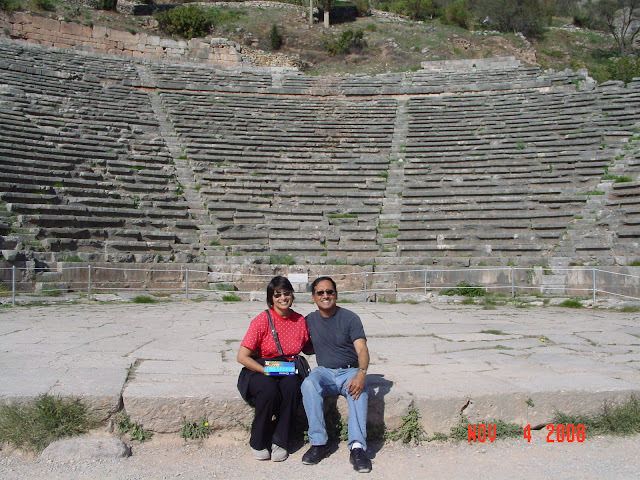 But we were waylaid en route by a travel agent who sought to sell us an expensive package tour and, in the process, informed us that our intended itinerary would not work as the ferry schedule is altered completely after November 1 when the official tourist season ends in Greece. Grateful for the information, we set about altering our travel plans in keeping with ferry routes and schedules, then booked our ferry tickets, called the hotels to modify our dates of arrival and departure and then finally boarded a trolley to get to the museum. The ride was novel and exciting and by the time we arrived there, we were all reved up and ready to go. The sheer size of the museum and its collection is overwhelming and we were grateful for Lonely Planet that pointed out the most important items. We saw the Mask of Agamemnon, the Bronze of Zeus (that some say is Poseidon), the gigantic Kouri–so similar to the one at the Metropolitan Museum in New York that I show on my own Highlights tour–the Cycladic Figures that so influenced Picasso and the Modernists, the frescoes excavated from Akrotiri on Santorini and several other significant classical works. Riding on the trolley back to our hotel, we were charmed by the energy and vitality of contemporary Athens. We sought out a taverna called Paradisio where local Greek patrons were tucking into plates of roasted sardines. We chose to eat a Greek Salad (so good we ordered a Greek salad with every meal from then on) and a Moussaka that was superb. The best part of this rather unpretentious place was that it was only steps away from our hotel and it was a joy to be able to get back into our comfortable bed in just a hop, a skip and a jump. First impressions of Athens? Admirable indeed. 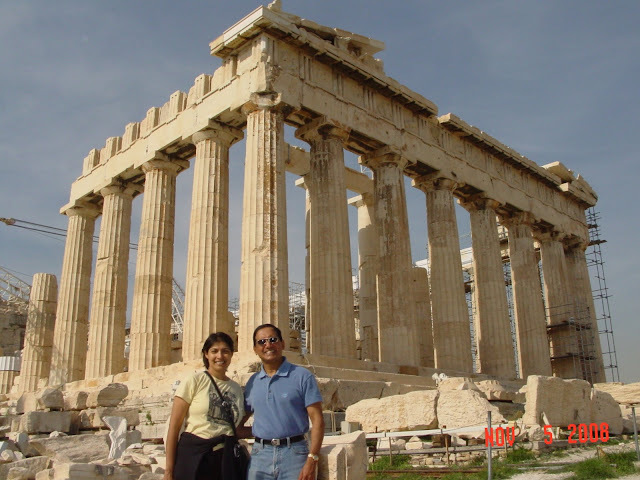 The next day, on one of America’s most historic days–the election of our first African-American President–Llew and I awoke in the very cradle of Democracy–Athens, Greece–and rejoiced. “He did it, babe”, Llew shouted to me through the bathroom door in our hotel in Athens after he received the news from a Greek TV station. We high-fived each other, then joined a jubilant band of local Athenians at breakfast, all of whom were celebrating the great win of Barack Obama and, hopefully, the beginning of Change in America. We were at the base of the Acropolis is ten minutes, strolling in leisurely fashion through Plaka, the area that looks completely different by daylight. Through the quaintest little Greek village we passed and joined the busloads of late-season tourists trooping towards the towering monuments at the top of the world’s most famous urban mountain. Twelve euros covered entry into a number of attractions and Lonely Planet made it very easy for us to tour the complex without the need of a pricey personal guide. 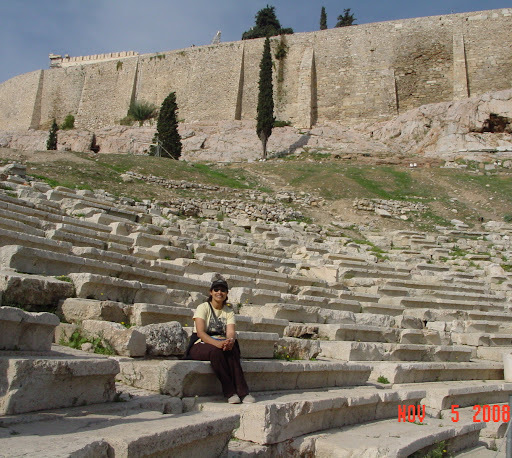 We passed by the awesome Theater of Herodes Atticus where we have seen so many famous performers (Yanni, Charlotte Church, etc.) wow audiences in recent years. It must be a stunning venue at night when the lights are turned on and the rest of Athens sleeps quietly just beyond the stage walls. Next, we advanced towards the Prophylea and the Temple of Athena Nike with its high steps and its endless scaffolding, for conservation is an on-going process at these ancient sites. Through the arches and into the main courtyard, the Parthenon finally came into sight. Of course, we spent ages examining it in loving detail, noting the acquisitiveness that led to the hacking of sculpture from the central frieze by Lord Elgin in what has become an endless controversy between Greece and the UK. It became clear to me then that he did not ‘rescue’ these sculptures in any way. They were not buried hundreds of feet beneath the earth as the treasures of Tutankhamen were, for instance, or the city of Pompeii. These marbles were just cut clean off the pediment and transported to England to the best of my knowledge on a bare whim. I realized that I ought to read more to educate myself on why and how the Elgin Marbles are now in the British Museum. At any rate, the two remaining sculptures–one on each end, of a seated youth, and a horse’s head–that are still on the structure are deeply stirring and I simply couldn’t take enough pictures of these works “in situ”. We then made our way towards the Erechtheion, another beautiful temple of Poseidon that features the Karyatids, a series of six sculpted women that are charmingly graceful. Here again, five of the originals can be seen in the Acropolis Museum while the fifth original is in the British Museum in London. 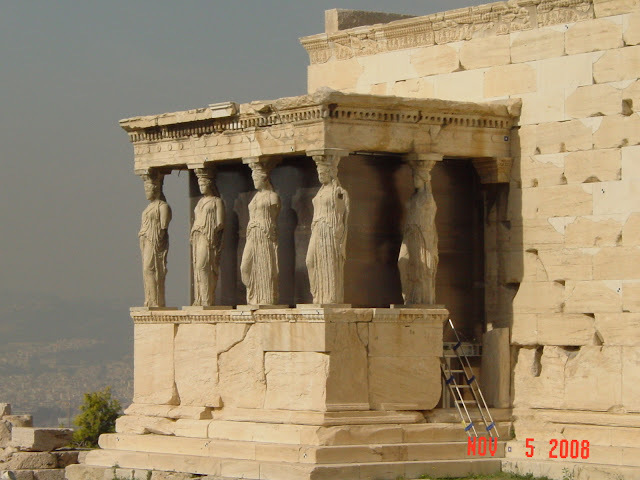 Plaster of Paris replicas of the five that are in Athens are placed on the building and they make a striking backdrop for pictures. Greece must be so enormously proud of these visions of Pericles that have allowed so many such buildings to survive, albeit in ruined form. Just at the foot of the Acropolis is the Theater of Dionysus, an enormous complex that is now in the process of refurbishment. 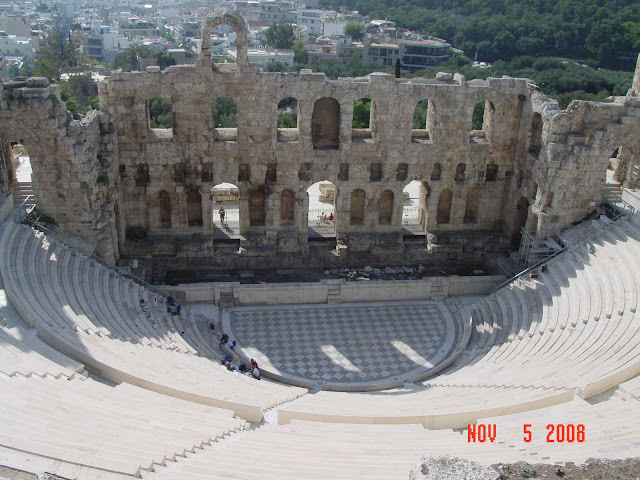 Here it is possible to see the original venue on which the plays of the Greek tragedians, Aeschyles, Sophocles and Euripedes were performed with the works of Aristophanes providing comic relief. Here were created the classical principles of dramatic composition upon which playwrights the world over have depended. The lion-footed throne on which the high priest sat to watch the shows is still in place and I was deeply stirred by my rambles through the Pentellic marble spectator stands of this strangely atmospheric place. The original Acropolis Museum which was a part of the Parthenon has been shut down and a superb new and very modern building has taken its place a few blocks away. Llew and I walked quickly there to see the original Karyatids only to discover that they were not yet in place as only part of the museum has been opened to the public. Instead, we were treated to a special exhibit containing the items that were acquired fraudulently by such great international museums as the Metropolitan in New York and the J. Paul Getty in Malibu, California, that have now been returned to Italy. These pieces, which include the famous Euphronious Krater about which I had learned while training at the Met, were on loan to the Athens Museum and were on display for a limited period before they find a permanent home in Italy. I was so thrilled to see the Euphronius Krater again–it was like running into an old friend! Indeed, I had wanted to visit the Met and bid goodbye to it at the time that the newspapers in New York were full of the news of its departure to Italy but had not been able to find the time–and little did I expect that I would see it again on foreign shores! That is the beauty of travel too, isn’t it? You never know what or who you will run into when you set sail for distant lands. I cannot wait to tell my fellow docents at the Met about my serendipitous discovery. After a delicious Greek Salad lunch on one of the wayside restaurants that line Adrianou just outside the gates of the Ancient Agora, Llew and I launched on to the next phase of our sight seeing–an examination of the Temple of Hephthasos, a classical Greek temple that stands almost intact on the great grounds that once constituted the most important part of official Athens. It was in the Agora (marketplace) that St. Paul disputed with his critics endlessly while trying to find converts to Christianity; it was here that Socrates was imprisoned and accepted the cup of hemlock that led to his heroic death; it was here that merchants, bankers and financiers created the economic glory that was Greece. Only three buildings are in a good state–the Stoa of Attalos, the Church of the Holy Apostles built in honor of St. Paul and full of lovely Byzantine mosaics and the Temple of Hephthasos. The rest of the Agora is in dismal condition, most of it lying in ruins in the shape of columns and blocks and red terracotta tiles–somewhat like the Roman Forum in Rome, only in worse condition. By this point in our day, my feet were fatigued and I needed to return to our hotel for a long rest. Upon awaking from a siesta, we went out in search of dinner and chanced upon Thannasis, a wayside restaurant at Monastiraki, which Lonely Planet had extolled as having the best kebabs in the city. And they were quite correct indeed. Our meal was simple–lamb kebabs with roasted tomato and onions wrapped in pita bread, but so delicious and so laughably cheap we actually spent less that three euros for the lot. For dessert, we picked up Sokolatina, a chocolate mousse pastry that had been recommended to us by Llew’s former Greek colleague Ted Francis. And it was simply fabulous! After a day that had been both historic and deeply fascinating, we packed up our few belongings and got ready for our early morning departure, the next day, for the ferry cruise to Mykonnos. Athens are just amazing and we were glad that our itinerary included one more day in the city on our way back when we hoped to explore those bits of it that we had yet to traverse. We returned to Athens after touring the Cyclades on our last day in Greece. It had been such a blissful ten days that Llew and are were loath to return to routine, even though, comfortingly, that routine would be, for me at least, in London. 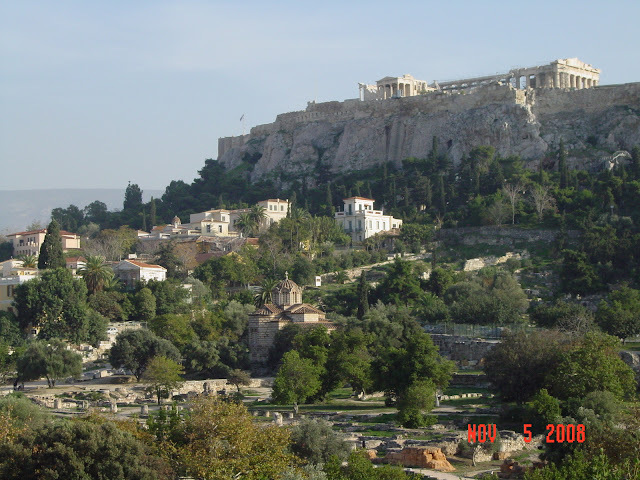 Though friends had told us that Athens can be covered in a day and a half, we so loved the city and its many varied quarters, some of which we had yet to explore, that we had several places lined up to see before we returned home. However, I woke up feeling awful and for some inexplicable reason, had no appetite or energy to tackle anything. Llew breakfasted alone while I took a rest and it was only after he had checked out, an hour later, that I stirred and found the enthusiasm to go ahead with our plans. 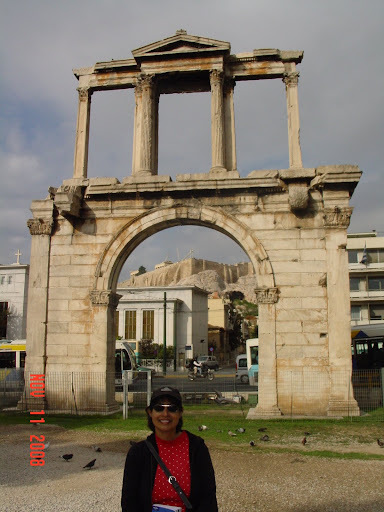 Our first stop was Hadrian’s Arch and the Temple of Olympian Zeus in “Roman Athens”. These remnants of Rome’s occupation of Greece take the form of large monuments in rather dismal shape. While the Arch is quite impressive, it is the few standing columns of the Temple that catch the eye–mainly because they are so tall. This temple was once the largest in Greece and though today only 17 columns remain, they do give an idea of how stupendous a sight it might have presented to contemporary Athenians. 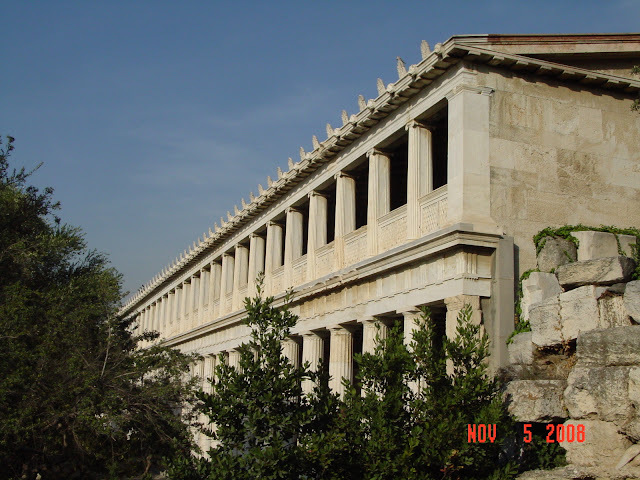 Then, we found ourselves skirting the Temple’s precincts and making our way towards the National Gardens to see the Zappeion, at the suggestion of Ted Francis, a corporate attorney in the States, who was once Llew’s colleague and is now a good friend. Ted has Greek heritage and Llew had made sure to ask him for his travel tips before he left the States. One of the places that Ted thought we should see was the Zappeion and I am very grateful he suggested this, not just because it allowed us to explore the interior of a very unique and very imposing Neo-Classical Building in the middle of the city, but because we also had the opportunity to explore the ‘lungs’ of Athens in the huge and very well-maintained garden. Inside the building–which is odd because it appears like a rectangular structure on the outside but is really circular within–that was used as the press center for the Athens Olympics in 2004, there was a publicity event on for the forthcoming Special Olympics and the press was busy setting up cameras and lights. 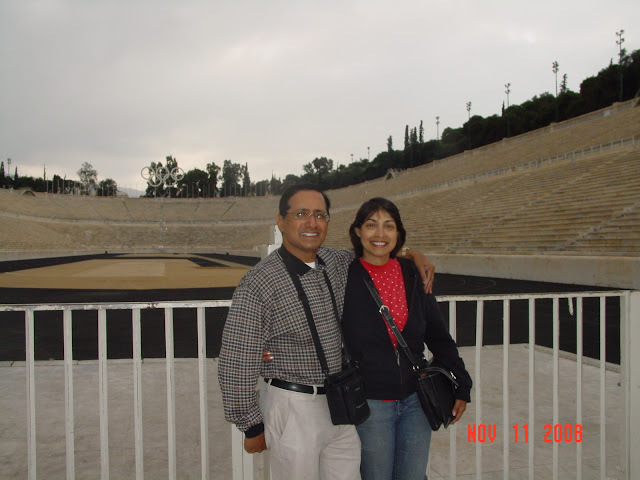 Having viewed the Zappaeion, we went in search of the Athens Olympic Stadium of 2004 and though finding it on foot following a map was something of a challenge, we were quite overwhelmed when we did see it. For the stadium is massive and entirely constructed of marble. The five international Olympic rings dominate the structure and make a marvelous backdrop for the pictures that visitors feel compelled to take. This was the stadium into which the finalists of the marathon entered at the end of their long run and we could just imagine what it might have been like–thousands of cheering fans greeting the winners and screaming during their victory lap. Walking through the lovely flower-beds of the garden, we arrived at the main thoroughfare, in time to take in the rituals of the 12 noon “Changing of the Guards” ceremony at Syntagma Square. This is very similar to the ceremony in London except that instead of wearing funny bear-skin hats, these Greek guards wear funny frilly skirts and large pom-pom shoes and march in the fashion that is distinctly reminiscent of John Cleese in Fawlty Towers in the episode in which he attempts to imitate a Nazi soldier. Needless to say, the moves of these guards brought a great deal of laughter–some of it suppressed, much of it not–and photo opportunities for the assembled tourists who arrive at the tolling of each hour. The handsome Parliament Building makes a very fitting backdrop to this ceremony which is performed on a platform that contains the Tomb of an Unknown Soldier. It is meant to be a solemn and dignified ritual and I was sorry that so many young tourists found it amusing. After resting for a bit, we walked along the main avenue towards the three Neo-Classical Buildings that one cannot fail to notice as one rides in the city’s trolley buses. 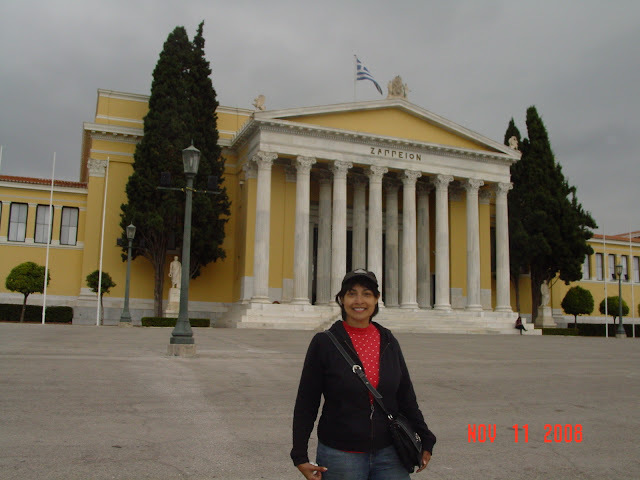 These comprise the Athens Academy, the University of Athens and the Central Library. Each building is more beautiful than the other, the Academy fronted by the statues of Socrates and Aristotle and crowned by those of Apollo and Artemis. At the University, we were delighted to have strayed into the midst of a graduation ceremony where lovely young ladies all decked out in summer floral dresses and chiffony frills with either improbably high heeled boots or delicate stilettos, bore large bouquets of flowers in their hands and posed for pictures with their loving relatives. It was a lovely sight to see and we were so glad to receive this spontaneous glimpse into contemporary Athenian culture. 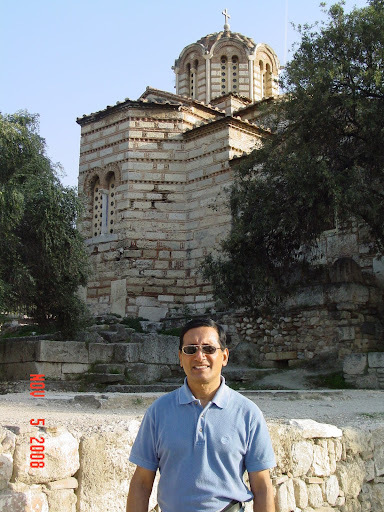 A few moments later, having covered Roman Athens and Neo-Classical Athens, we crossed the street and went in search of Byzantine Athens represented by the ancient churches that dot its oldest quarters. Llew was especially keen that I visit the 11th century Church of Kapnikarea that stands smack in the middle of Ermou, one of the city’s busiest shopping areas and which he had seen earlier on one of his solo rambles. This tiny church is so old that when you enter it, you almost expect its walls to crumble in your hands. It was time for lunch and we hurried again to Thannasis which was doing roaring business at midday. It was our last chance to enjoy a really good meal and we opted for a Greek Salad and the Moussaka, which was served in the terracotta pot in which it had been baked and was easily one of the best we have ever tasted. Over Mythos beer, this meal went down like a dream and we were so glad that we would take back superb memories of Greek food through the many varied restaurants we had visited on the recommendation of Lonely Planet. On the way back to our hotel to pick up our bags, we did have a chance to see one more old church, the large Cathedral which stands right next to the smaller 12th century Church of Agios Eleftherios. All Byzantine Greek churches have a similar design inside and exude an air of religious formality through the use of swinging incense-burners and glass chandeliers. It was, sadly, time for us to think of returning to our hotel as our flight left at 8pm. We wanted to arrive at the airport by 6 pm, which meant that we needed to get on the metro by 5 pm. A last stroll through Monastriki allowed us to pick up some inexpensive souvenirs trinkets for relatives and a scarf for me depicting the glory of classical Greek architecture, before we arrived at Acropolis House and picked up our baggage. En route to the metro stop, we could not resist stopping at Syntagma Square to pick up some edible goodies to carry back home–Greek pistachios, mixed nut brittle studded with sesame seeds, and some more sokolatina (chocolate mousse pastry) from our favorite confectionery at the corner. On the metro back to the airport, we ran into the group of four Asians–two couples from Hongkong–whom we had seen repeatedly on our travels. Together, we entered the train that spirited us away to the airport and on to our Easyjet flight which landed at Luton airport in London at about 11 am. Because there wasn’t much traffic on the motorways at that time of night, we did manage to get to the Baker Street Tube stop before the last train left and the system closed for the night. 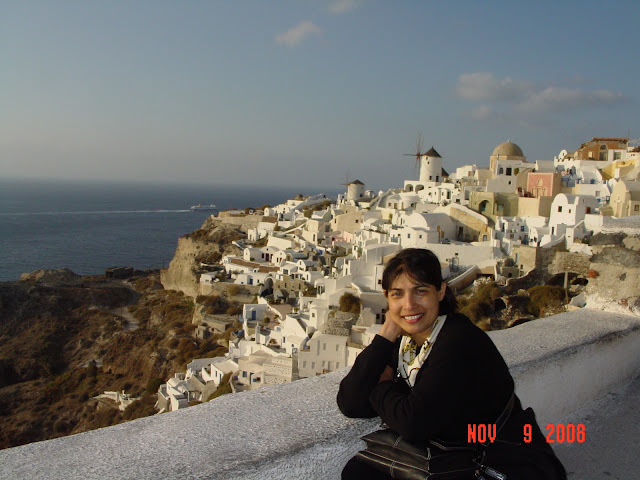 We were home twenty minutes later, holding close to our hearts, some indelible memories of the ten blissful days we had spent in Greece–the cradle of Western civilization. 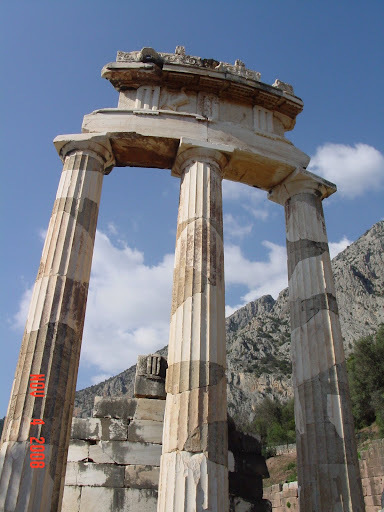 To read about our visit to Delphi, please click on the link. 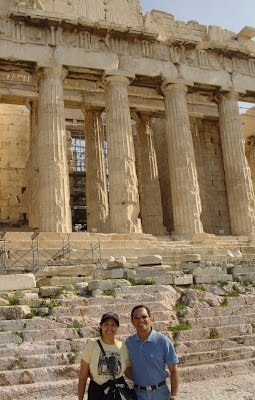 Greece is the Acropolis and the Parthenon, two of the most easily recognized images of its colorful and glorious culture. But that’s not all. Greece is also cloudless blue skies reflected in the jade, acquamarine and turquoise of Aegean waters. Greece is gorgeous beaches and classical ruins. But Greece is also a mainland and a splatterings of islands whose shores are composed of black volcanic sands. Greece is the home of the Gods–Apollo and Artemis, Dionynus and Aurora but Greece is also the playground of mythological heroes such as Theseus, Adriane, Jason and, of course, Ulysses who sailed around the furthest reaches to encounter the oddest beings and vanquish them. Greece is the home of ouzo and retsina and it is also the birthplace of gyros and souvlakis, mousakka and taramasalata, saganaki and feta cheese, ‘waterless’ tomatoes and juicy cukes that taste as if they’ve been freshly plucked from the vines. The favors of lemon and oregano coalesce perfectly with those of olive oil and capers to produce the famous Mediterranean diet that has been proven to be the world’s healthiest. 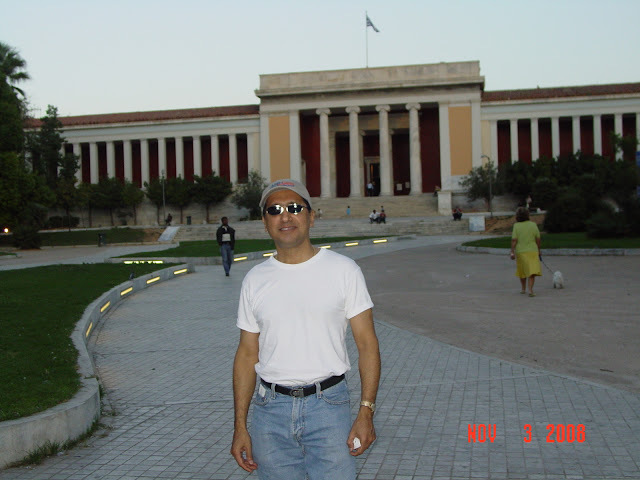 Greece is the glory of the Olympics Games, the noble seat of Democracy, the learned birthpace of Socrates, Plato and Aristotle and the center of the world’s shipping industry created by more modern-day magnates such as Aristotle Onassis. Llew and I relished every moment of the ten days we spent exploring all that Greece could offer–the mystique of the Oracle at Delphi, ancient excavated ruins at Delos, the island paradise of Mykonnos and the spectacular sunsets of Santorini. In between, while island-hopping, we took in Syros and Tinos (albeit by mistake) and, of course, we succumbed to the seductive charms of Athens, if only in the many tavernas where we feasted on some of the most memorable meals we have ever eaten. Join us now on our travels in Greece and accompany us as we start in the capital city of Athens.